Alan Gustafson, crew chief for driver Jeff Gordon, knows all about the unpredictability of a race at Talladega Superspeedway. Perhaps unlike any other track on the NASCAR circuit, Talladega Superspeedway takes the majority of control out of the crew chief’s hands. While preparation is still paramount to success, the overall outcome of the race is ultimately in the hands of the drivers on the track. For the guys calling the shots atop the pit boxes, the strategy is fairly simple: bring a fast race car, communicate well and control what you can. 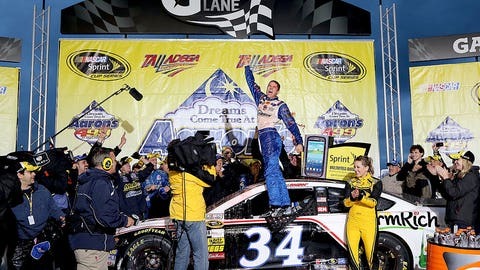 "There’s a lot of things you can’t control, but there’s a lot of things you can control and they have a major impact on the race," Hendrick Motorsports’ Alan Gustafson told FOXSports.com Friday at Talladega. "That’s the biggest thing for us: the car, the communication and the execution in practice and on race day." Gustafson’s driver, four-time champion Jeff Gordon, enters Sunday’s race sixth in the Chase standings, just one point ahead of the eight-place cutoff to advance to the next round. Throughout the weekend, Gustafson said it is important to figure out how well the car handles in the draft, but added that there is also a fine balance between the risk of finding trouble and the reward of fine-tuning the car. There are certain things out of your control, so there’s no sense in spending your time and energy on that stuff. "You’ve got to have a good car that’s fast and comfortable," said Gustafson. "It’s really tough to put yourself in all the situations that you’ll be in during the race in practice, because a lot of those situations are pretty risky. You’ve got to balance that, and that’s probably the toughest thing to do. How many situations do you want to put yourself in during practice that are risky? You’re going to be in that position all race, so it’s important to know what your car’s going to do, but at the same time you don’t want to give it all away in practice." With his driver, Matt Kenseth, sitting 12th in the Chase standings, 35 points behind the eighth-place cutoff, Joe Gibbs Racing crew chief Jason Ratcliff said he has one goal this weekend: bring a fast car capable of winning the race. Instead of focusing on the different possibilities, Ratcliff will keep his team focused on that goal. "There are certain things out of your control, so there’s no sense in spending your time and energy on that stuff," said Ratcliff. "We’ll just focus on making our cars fast, having good pit stops, keeping up with what we need to do to keep the car up front, and that’s really all you can do." Despite the unpredictability of racing at Talladega, Gustafson said the preparation at the shop is no different than any other week. While it may look as if teams are not making wholesale changes to the shocks and springs during the weekend, the preparation at the shop is just as important this week as it was last week or will be next weekend. "The preparation at the shop is the lion’s share of what happens," he said. "This week I think it’s just a little magnified because we don’t make as many changes at the track. I think it will be the same in Martinsville (next week), though. It’s important to have the car prepared correctly, all the stuff from the shop and the game plan from the shop is paramount to success." 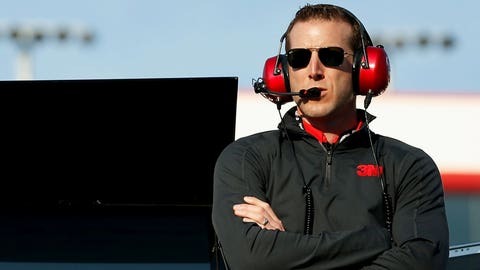 Furniture Row Racing crew chief Cole Pearn echoed Gustafson’s thoughts, saying the preparation throughout the weekend is not much different than any other race weekend. "You just try and make sure you have the best car you can, that’s really the only thing you can control going into the race," he said. "Hopefully having a strong car opens up more possibilities to allow you to do what you need to do. I guess not sleeping much is the main thing (that is different)." With four drivers being eliminated from championship contention after Sunday’s race, tensions are high in the garage. But most crew chiefs understand a lot of what takes place on the track is beyond their control. "There are things that you just can’t control, and if you try to control those things you can get yourself in a lot of trouble," said Gustafson. "You have to control what you can control and do the best you can. The rest of it, it’s just really not up to you. You have to be at peace with that. If you try to force it, you can get yourself in trouble." Hoping to keep the No. 78 team’s championship hopes alive, Pearn believes Sunday’s race is one of the biggest of the season. "It could be your year. If it doesn’t go your way it could all be over," he said. "It’s definitely difficult. These races are so hard. There are numerous different scenarios that could play out depending on the situation you’re in. We’ve still got a couple days to think about it and see how it goes." For Ratcliff, the points deficit they face heading into Sunday’s race allows them to keep things simple and focus on winning the race. He hopes the other 11 Chase drivers fighting to stay alive in the championship battle overthink things and get off their game. "You’ve got a lot of guys in different scenarios," he said. "There are five or six cars that are really tight on points, so everybody is going to have a little bit different perspective going into it and a little different game plan. Here it can change so fast, lap-to-lap, position-to-position, it can fluctuate so much that you can get too conservative as well. "We’re not trying to find a point or two, we need to go out there and try to win the race. The strategy is pretty simple. It’s pretty straightforward. There’s a lot of guys that I think could be too conservative and find themselves in a bad spot in the closing laps."